Micron Technology, Inc. (Nasdaq:MU), one of the world's leading providers of NAND Flash and advanced solid-state storage solutions, today announced that it has developed a 2.5-inch enterprise solid-state drive (SSD) based on a PCIe interface. The solution combines a high-performance PCIe interface with a hot-swappable 2.5-inch form factor that creates new options for enterprise server performance scalability and serviceability. Because the 2.5-inch form factor allows PCIe SSDs to be integrated into the front end of the server (like traditional data storage drives), customers can easily service the drive or scale performance — without ever powering down the server. The new solution has been selected as a key storage device in Dell's PowerEdge 12th generation servers. These servers use innovative, front-accessible backplane designs that accommodate 2.5-inch SATA, SAS, and PCIe devices, allowing the customer to choose the appropriate combination of data storage and caching devices to optimize performance and storage to suit their needs. Customers can easily configure their solutions by hot-swapping PCIe devices without powering down the server — a requirement with existing PCIe card solutions. "We're pleased with the results of our strategic collaboration with Micron to co-develop this innovative new form factor for our Express Flash solutions," said Brian Payne, Executive Director of Server Solutions at Dell. "Their knowledge in Flash design and SSD technology helped Dell create scalable high performance servers to handle demanding workloads and latency sensitive applications." "The 2.5-inch PCIe SSD is a great example of how the Micron team has leveraged our NAND expertise and IP — the fundamental building blocks of SSDs — to develop high-performance, high-reliability enterprise storage solutions," said Glen Hawk, Micron Vice President of NAND Solutions. "Being selected as a key partner to Dell illustrates an important success in our ongoing strategy to transform leading-edge NAND technology into value-add enterprise solutions." 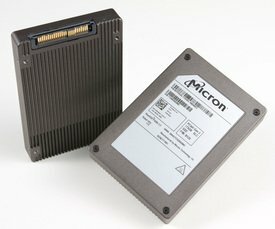 Both Micron and Dell are helping drive adoption of this interface through their membership in the SSD Form Factor Working Group (ssdformfactor.org). The working group is a broad industry effort to simplify the adoption and integration of PCIe storage drives, enabling breakthrough storage performance to reach broader audiences. The new platform leverages Micron's P320h PCIe SSD design and is based on a custom-developed Micron controller, creating a vertically-integrated solution with leading-edge PCIe SSD performance. The 2.5-inch PCIe SSD is part of a full portfolio of enterprise-focused NAND components and SSDs, and it complements the P320h HHHL card form factor, providing Micron with multiple avenues to deliver the high-performance, high-reliability storage solutions required by demanding cloud applications like video streaming and virtual networks. Micron is currently in production with the P320h HHHL card and is sampling the 2.5-inch PCIe solution to interested customers.